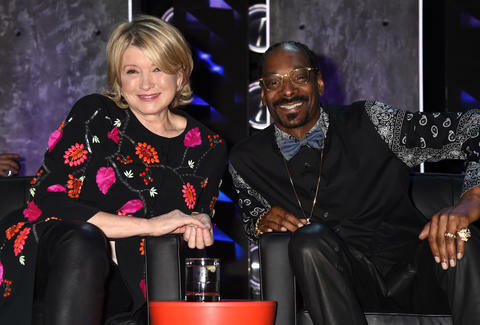 If you like your cooking shows served with a medicinal dose of weed jokes, you're in luck: lifestyle empire-builder Martha Stewart and rapper Snoop Dogg will be joining forces for a new VH1 cooking series that's tentatively titled Martha and Snoop's Dinner Party. One imagines that title will change to some weed-related pun that a roomful of VH1 executives haven't had the time to figure out yet. Maybe Munchies with Aunt Martha and Uncle Snoop? As Variety reports, the show, which is set to premiere this fall, will combine the Connecticut branding queenpin's love of cooking with the California rapper's love of inserting himself into random things you are watching on TV and making them more enjoyable. One assumes the show will be like IFC's Dinner for Five, but instead of Jon Favreau holding court as Michael Rapaport and Jay Mohr trade insults, you'll have Martha and Snoop shooting potshots at each other and cooking as other celebrities drop in. Pray for a Bieber cameo. Dan Jackson is a staff writer at Thrillist Entertainment. He's on Twitter: @danielvjackson.